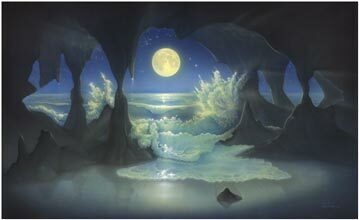 The rare and exciting experience of exploring a sea beach cave is here enhanced by the advance of tide with the rising of a full moon. The dark silhouette of the cave that looks out to sea frames this scene of shimmering sand that washes back with the rhythm of the advancing surf. The roar and echo of this special environment is awesome as the breakers dash over the floor and fall back, sparkling in the soft moonlight. What buried treasure or romantic adventure lurks there is the stuff of sea novels and cave explorers' dreams. The working of perhaps thousands of years to create this sculpture in sandstone and coral, with its stalagmites and stalactites is testimony to the ancient history of this seemingly sacred grotto. Haunted by the songs of whales and passage of countless moons, only time will tell how the story of this natural hall of dark and wet shadows evolves.